Please note: Cal Poly Report will be published two more times this academic year, on June 6 and 13. The newsletter will be published monthly during the summer, on July 11 and Aug. 15. Ride the swells of the Pacific alongside staff and faculty. Hear the stories of undocumented students navigating an uncertain future. Meet biomedical engineering students leveraging their own experience in hospitals to help others. Chow down with a student chef creating his own prix fixe menu inspired by his family heritage. All these stories and more are in the new issue of Cal Poly Magazine, now online at magazine.calpoly.edu. Look for print copies in magazine racks throughout campus after June 1. Join University Marketing for a summer series of workshops aimed at sharpening skills among staff, student assistants and faculty who manage and create content for Cal Poly websites. The workshops will help campus prepare for the planned website redesign that will be phased in beginning in 2019. The series’ kickoff — including a status update on the website redesign project — will be held from 2 to 3 p.m. Thursday, May 31, in the Baker Center for Science and Mathematics (No. 180) Room 102; a monthly workshop will follow. The workshops will include best practices on search engine optimization (SEO), writing for the web, reporting key metrics and content strategy. View the full schedule of workshops and RSVP via the event’s Google form. Learn more about the project on the website redesign wiki, or direct questions to web-comms@calpoly.edu. The Office of University Diversity and Inclusion is excited to announce the inaugural BEACoN Research Symposium from 9:30 a.m. to 3 p.m. Wednesday, June 6, in the Berg Gallery (located in the Architecture and Environmental Design Building, No. 5, Room 105). 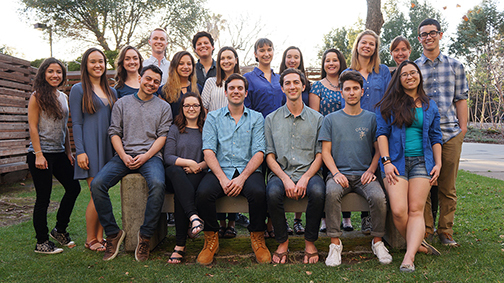 BEACoN is a mentoring program that pairs underrepresented students with faculty mentors, with the goal of educating and empowering students to reach their full potential at Cal Poly. This year the office launched a research component, and students' two-quarter research projects will culminate with a research symposium. At the symposium, 15 students representing all colleges will present their research experiences as well as what they have gained from being a part of the program. A detailed schedule of the event is posted on the BEACoN website. Contact OUDI at diversity@calpoly.edu with questions. A record nine intercollegiate athletics teams posted perfect 1,000 Academic Progress Rate scores during the 2016-17 academic year, and eight squads registered improvements in their four-year rate scores. Five others maintained their four-year rate scores of a year ago, according to data released by the NCAA on Wednesday. Every Division I sports team across the nation calculates its APR each academic year, similar to a report card. Five teams — men's golf, men's swimming and diving, wrestling, women’s tennis and women's track and field — have four-year rate scores within their sport ranked at or above the 70th percentile. The nine teams with perfect 1,000 scores during the 2016-17 school year are men's golf, men’s swimming and diving, men’s tennis, women’s cross country, women’s golf, softball, women’s tennis, women’s track and field and women's volleyball. The Mustang men's golf, women’s beach volleyball, women’s tennis and women’s track and field teams earned public recognition awards from the NCAA last week for achieving four-year rate scores above the 90th percentile. It was the fifth consecutive year for men's golf. The four-year rate score of 1,000 for the Mustang women's tennis team is a 20-point improvement while football increased 11 points to 972. In addition, women's track and field jumped 10 points to 998. Other Cal Poly teams showing improvement in their four-year rate scores are baseball, men’s cross country, men’s swimming and diving, women’s golf and women’s indoor volleyball. Read more here. College of Engineering students took the top three honors and shared $30,000 in this year’s Innovation Quest, an annual competition that encourages innovators to pursue their ideas and provides award money that can be used to launch businesses. 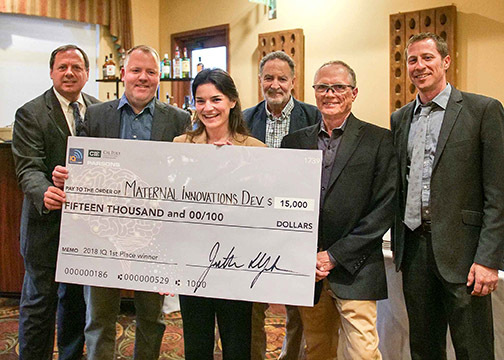 The competition, sponsored by the Center for Innovation and Entrepreneurship (CIE), was held April 28 at the San Luis Obispo Country Club. Sara Della Ripa, a biomedical engineering graduate student, won the $15,000 top prize for creating a potentially life-saving medical device that could predict symptoms of hemorrhaging in new mothers (pictured). The $10,000 second-place honor went to a team that developed Clove, a device that automatically grows and maintains up to 24 plants for culinary use with little to no user interaction. Clove was conceived by business administration seniors A.J. Gankhuyag and Kieran Scandrett, mechanical engineering senior Alexander Decker and biomedical engineering senior Aaron Quinn. The $5,000 third-place prize went to Lost Coast Surf Tech, which designed what they call the world’s best performing surfboard fin, with smart tracking features integrated into a comprehensive mobile app. Graduate aerospace engineering majors Shaun Wixted and Brandon Baldov developed the technology. Read more here. The University Art Gallery will present “This Must Be The Place,” featuring multi-disciplinary works by students graduating from the Art and Design Department. The exhibit will open with a reception at 4 p.m. Friday, June 1, in the University Art Gallery, located on the ground floor of the Dexter Building (No. 34). Light refreshments will be provided. Works by the following artists will be featured: Carter Broad, Vivien Cheung, Ally Evans, Lauren Goldenberg, Mallory Harris, Julia McClintock, Noelle Merrihew, Carlie Meyers, Amanda Parra-Settles, Vianca de la Parra, Chloe Plant, Alana Primes, Thomas Stoekinger, Anna Teiche, Lela Welch, Olivia Witt, Roslyn Yeager and Solstice Zaranski. The gallery is free and open to the public from 11 a.m. to 4 p.m. Tuesday through Saturday. The exhibit will run until June 16. 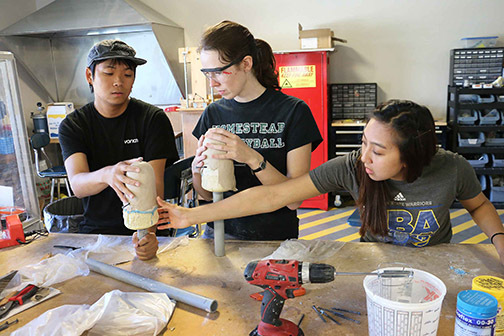 Architecture students in the third-year Comprehensive Design Studio will present their work June 7 to the Fresno community during an event that is open to Cal Poly alumni and the public. The students were asked to propose projects that would address the current conditions and future potential of Fresno, a culturally rich city that is also one of the fastest-growing cities in the state. The students partnered with Darden Architects, ZGF Architects, LPA Inc., Flad Architects, WRNS Studio and Duy Tan University to design nine projects near the new high-speed rail station in downtown Fresno. Eighteen architecture students will present exhibits that each include a site model, large-scale building section models and two posters, according to architect and faculty member Stacey White. Projects include a performing arts center, STEAM (science, technology, engineering, art and mathematics) high schools, a recreation and wellness center, a medical simulation building, agricultural research buildings, a retail/clothing design center and a children’s preschool. The students are Connor Earnest, Crystal Ueno, Jayde Mitchell, Ricardo Hesse, Shane Lounibos, Deniz Karadere, Miranda Hassler, Mikki Okamoto, Emily Hamren, Courtney Petrella, Kallie Greenshields, Travis Koss, Eric Jeschelnik, Ally Austefjord, Vardan Asatryan, Sadie Carlson, Jessica Goswick and Shabnam Mashhoon. The presentations will be held from 5:30 to 7:30 p.m. Thursday, June 7, at the Downtown Club, 2120 Kern St. in Fresno. The event is co-sponsored by Downtown Fresno Partnership, American Institute of Architects – San Joaquin Chapter, and the Cal Poly Alumni Association – Fresno Chapter. Visit the event’s Facebook page for more information. Campus Dining and University Catering were both recently recognized for excellence by The National Association of College and University Food Services. 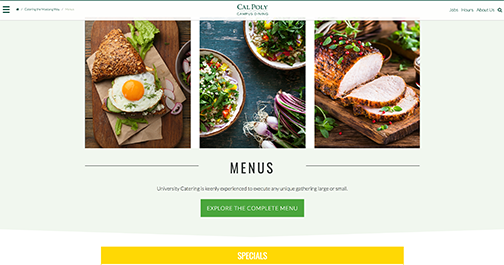 University Catering, a service of Campus Dining, was awarded Gold in the Online Catering Menu category, and Silver in Catering Special Event for last year’s Executive Dinner. The annual Loyal E. Horton Dining Award celebrates exemplary menus, presentations, special event planning and new dining concepts in campus dining services. This is the second time that University Catering has won Gold for Online Catering Menu; the first was in 2014. Campus Dining most recently won Silver for Catering Special Event in 2016. Representatives from Campus Dining will receive the awards at a national conference in July in Providence, Rhode Island. The campus community is invited to register for a workshop titled Responding to Hidden Bias, which focuses on responding to your own and others’ biases. Participants will have the opportunity to dig deeper to develop and practice ways to respond to intentional and unintentional bias and learn of resources for additional learning. This workshop is at the request of those who already attended the Exposing Hidden Bias workshops focused on increasing awareness of unconscious bias and strategies for avoiding its impact in our work and relationships. Participants are encourage to first attend the Exposing Hidden Bias workshop as a baseline prior to registering for the Responding to Hidden Bias workshop. Select the preferred workshop for more information and to register: Exposing Hidden Bias and Responding to Hidden Bias. A Responding to Hidden Bias workshop will be held June 13. The next Exposing Hidden Bias workshop is set for June 27. Both workshops are currently at capacity, but interested participants are encouraged to join the waitlist. 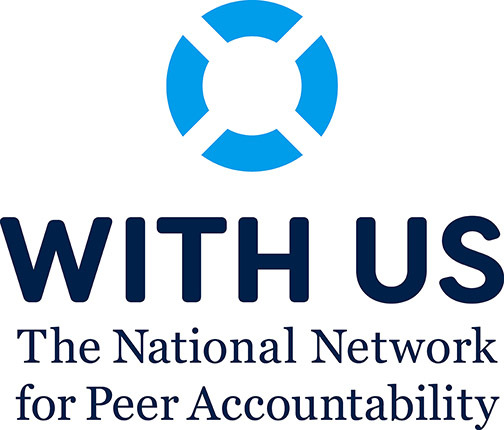 Funding is available to faculty for research related to the mission of WITH US, a national multi-issue bystander intervention research center recently established in Student Affairs. Faculty with interest in funding and research to practice collaborations related to bystander intervention; social justice; violence prevention; health promotion; harm reduction; sexual assault and harassment; hate, bias and discrimination; hazing and bullying; and alcohol and other drugs misuse and abuse are invited to apply for modest seed funding by Monday, June 11. Up to $5,000 in research funding will be awarded to selected applicants. Complete the online application here and email completed proposals to withus@calpoly.edu by June 11. Learn more about at www.withus.org. The Center for Teaching, Learning and Technology is accepting proposals from faculty who would like to "flip" a portion of their courses to replace lecture time with hands-on Learn by Doing activities. Candidates will receive a $1,200 stipend upon successful completion of all workshop activities and attendance at four face-to-face meetings. Lunch and resources will be provided. Seats are limited and will be filled on a first-come, first-served basis. Submit your proposal soon to secure your spot. The August session will be held Aug. 7-21, with a final project due Aug. 31. Required in-person meeting dates will be held Aug. 10, 14, 17 and 21. The application deadline is June 15. Learn more here. Questions? Contact Pam Dougherty at padoughe@calpoly.edu. Human Resources' Benefits and Employee Services Team members will be on hand to answer questions about what health incentives and other benefits you may not know you have. Bring your lunch and learn anytime from 11:30 a.m. to 1:30 p.m. Thursday, May 31, in the Facilities Building (No. 70), Room 110. Team members will be on site to answer benefit questions. Drop in at your convenience. — Agricultural Education and Communication Department: Fresh Perspectives: Creating a Collaborative Culture in CAFES. — College of Liberal Arts Advising Center: Multicultural Program for Student Engagement and Inclusion Welcome. — Chicana/o Latino/a and Indigenous Alumni Chapter: Summer Barbecue. — Chicanx/Latinx Faculty Staff Association: Fall 2018 Convocation/Welcome. — Cross Cultural Centers: Dolores Huerta: Change Maker, Civil Rights Leader. — Gender Equity Center: Women's Science Fair. — Latinos in Agriculture: Discovering Agriculture: The Transfer Experience. — LSAMP/CESAME (Louis Stokes Alliance for Minority Participation/Center for Engineering, Science and Mathematics Education): Decolonizing High Impact Practices. — New Student and Transition Programs: Week of Welcome Awareness Gallery. University groups and departments can apply for funding to support campus events that increase understanding of, and appreciation for, diversity and inclusion. For more information, visit the Diversity Funding Committee website. The board of directors of the Cal Poly Corporation will hold a regular meeting at 8:30 a.m. Friday, June 1, in the Corporation Administration Building (No. 15), Conference Room 124, on campus. This is a public meeting. For more information or to obtain a copy of the meeting agenda, contact Ann Roy at ext. 6-1131. The last day students may work through the Federal Work-Study Program for 2017-18 is Saturday, June 16. Work-Study payroll must be submitted prior to the June payroll deadline. Any "late" payrolls will be processed through regular student pay since late Work-Study pay cannot be authorized. During finals week, Work-Study students may work up to 20 hours. There is no Federal Work-Study during summer quarter. The 2018-19 Federal Work-Study Program will resume Thursday, Sept. 20. All international travel conducted as Cal Poly business must go through the Cal Poly International Center. International travel packets must be completed and submitted electronically through https://abroad.calpoly.edu (select "International Travel"). 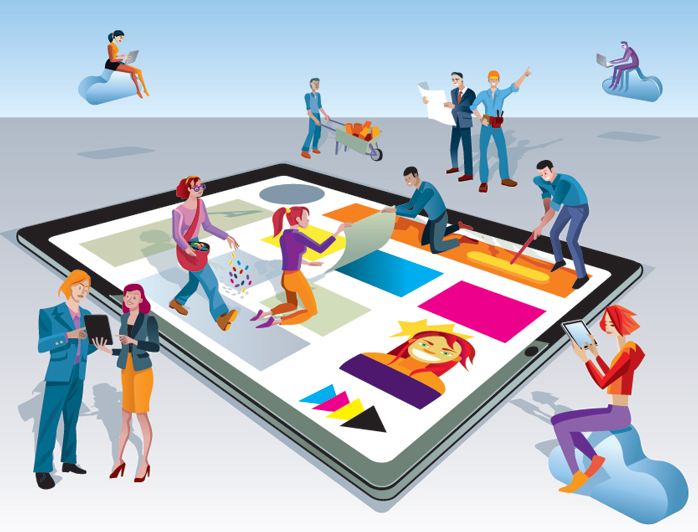 The online system allows the International Center to retain all information in one secure area, enhance travel safety, ensure compliance with CSU policies and procedures and provide for rapid location and communication in the event of an emergency. Note that there are new student fees and deadlines for non-study abroad international travel. Travelers must submit a completed travel packet by the required deadlines posted on the site in order to have their travel approved. For more information or to request a workshop, contact the International Center at intltrvl@calpoly.edu. The campus community is invited to join the College of Liberal Arts and the Provost’s Office from 3 to 5 p.m. Tuesday, June 5, in the Performing Arts Center lobby to wish College of Liberal Arts Dean Douglas Epperson a fond farewell. All are invited to celebrate his August retirement with wine, beer and hors d’oeuvres. 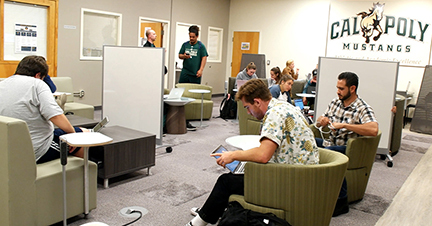 “Under Dean Epperson's leadership, the College of Liberal Arts has achieved a new level of excellence,” said Kathleen Enz Finken, Cal Poly’s provost and executive vice president for academic affairs. 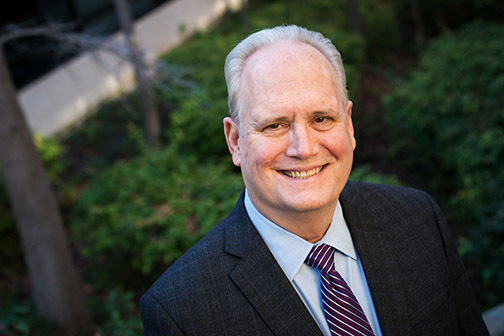 “He has been instrumental in understanding and promoting the critical role of the arts, humanities and social sciences in our polytechnic environment.” Epperson has been the dean of Cal Poly's College of Liberal Arts since 2012. Prior to that appointment, he served as dean at Washington State University and associate dean at Iowa State University, where he was an administrator and professor in the Psychology Department for more than 25 years. “This was an enormously difficult decision to make, because I have greatly enjoyed my time at Cal Poly,” said Epperson. 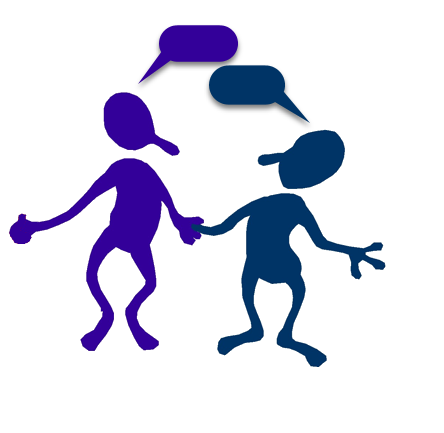 “I have never worked with a better or more collaborative and effective group. My only regret is that I was not able to spend more of my career with such a fine college at such an excellent university.” Epperson has been a strong proponent for interdisciplinary collaboration at Cal Poly. He helped to introduce four new minors that combine the studies of science, technology and society. He is also committed to diversity and inclusion. He formed a standing inclusivity and diversity committee for both students and faculty, and he hired the first associate dean for diversity and curriculum in CLA. Outside of higher education, Epperson was chair of the Council of Counseling Psychology Training Programs and was a fellow for the American Psychological Association, Society of Counseling Psychology. Questions? Call Lynne Ricard at ext. 6-2706. Bob Schrempp is retiring in June after 34 1/2 years on staff. He started his time at Cal Poly as a student in September 1979. In January 1980, Schrempp was hired as a student assistant in the Audio Visual Department and moved to a staff position in December 1983. He spent the next 17 years working in Communications Services (now ITS) in various roles,, including instructional support assistant, equipment technician, programmer, LAN coordinator, network analyst and as member of the Campus Emergency Operations Center. Schrempp has worked in Administration and Finance as an information technology consultant since 2001. In his positions, he has done just about everything there is to do with computers: pulling cables in manholes, managing databases and servers, and installing and programming fire alarms, to name a few. As a student, Schrempp was a WOW leader and continued to help and support WOW for 11 years. He volunteered as the Rose Float advisor from 1988-97. He is currently active with PolyCon, the Cal Poly Board Gaming Club. After Schrempp retires, he plans to spend more time on his hobbies of board gaming, prototype model trains and his laser-cutting and engraving business, Prawn Designs; in addition to taking RV trips with his wife, Katie. A farewell reception will be held from 1:30 to 3:30 p.m. Friday, June 8, in the Facilities Building (No. 70), Room 110. Light refreshment will be served. David Harris, M.D., executive director of Campus Health and Wellbeing, will retire June 1 after 14 years of service to the campus. 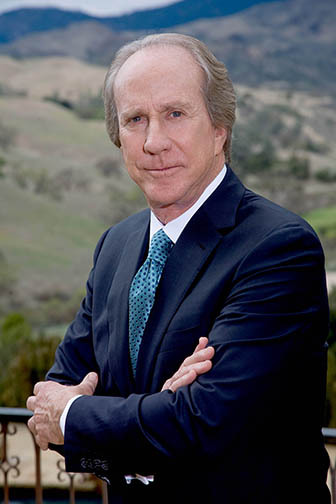 Prior to coming to Cal Poly, Dr. Harris served the community as emergency physician and president and CEO of Arroyo Grande Medical Group. 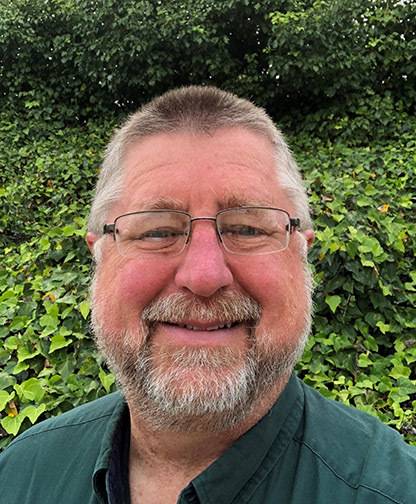 He joined Cal Poly as a staff physician in December 2004, was promoted to medical director four years later, and assumed the role of executive director in 2013. He was honored as an Outstanding Staff Employee of the year in 2012. He has been a true inspiration to the Campus Health and Wellbeing staff, and his contributions are integral to the department’s success and growth. He will be deeply missed. To celebrate his well-deserved retirement, the department is hosting a farewell party at 5 p.m. Friday, June 1, on the lawn in front of the Health Center. Join us to thank Dr. Harris and wish him the best. Jordi Puig-Sauri, professor in the Aerospace Engineering Department, will retire July 1 after 19 years of service. Puig-Sauri joined the department in 1998 as an associate professor. He was awarded tenure and promotion to full professor in 2002. He served as chair from 2004-08. When he started with Cal Poly, the department had very little in the way of spacecraft-specific education for students. Puig-Sauri developed a design track specifically for spacecraft and was instrumental in the creation of a concentration in astronautics within the aerospace major. Puig-Sauri's contribution to the aerospace community as a whole has been monumental. 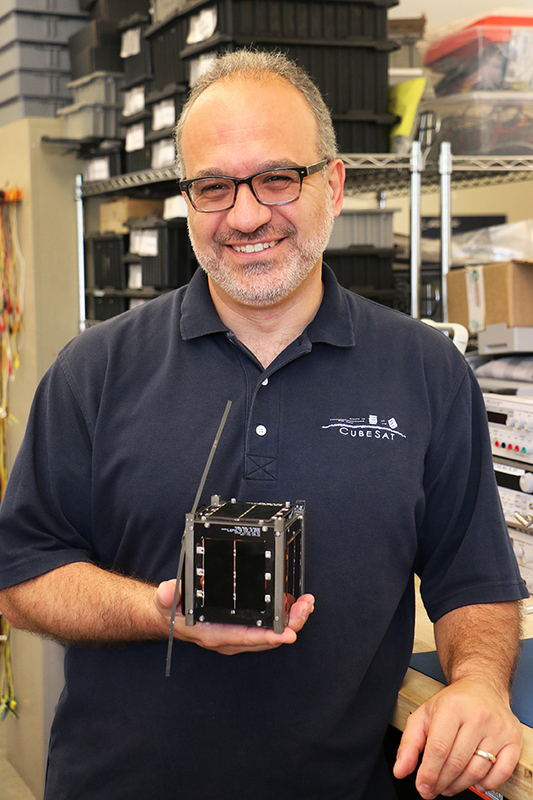 He is the co-inventor of the CubeSat standard, which led to the launch of the first CubeSat in 2003. Through his efforts, the Cal Poly CubeSat lab has developed and launched 12 CubeSats with seven more in development. Cal Poly has also launched 153 CubeSats on 24 missions from all around the world. His contributions to the university and to student success have been immeasurable. He was the principal investigator on more than 100 projects and grants totaling over $20 million. He will be sorely missed as he moves into retirement and sails around the world. Jo Ernest, personnel analyst for the College of Engineering, will retire July 2 after nearly 30 years of service. 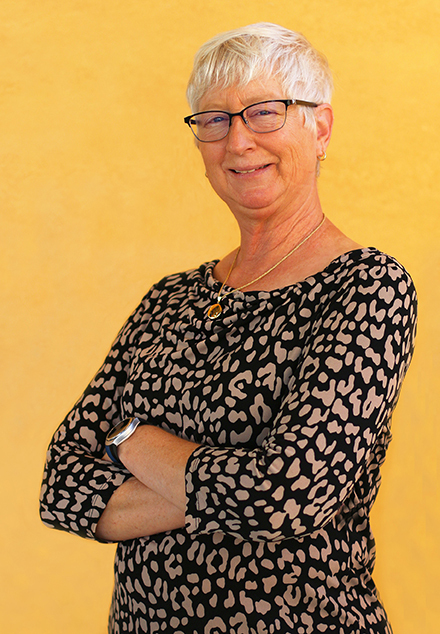 Ernest began her career at Cal Poly in 1988 with the Cal Poly Foundation in the Grants Development office. Since then she has worked in the Cooperative Education Program; Career Services; Architecture Departmen; the College of Agriculture, Food and Environmental Sciences; and Academic Personnel. While in Academic Personnel, she was asked to help with a re-organization, and began working in the Employment Equity and Faculty Recruitment Office, where she was responsible for faculty visas, faculty recruitment, and budget for the three areas under the umbrella of Academic Personnel. She finally found her true campus home when she began working in the College of Engineering Dean’s Office in 2006 as the personnel analyst. Ernest received the CENG Outstanding Staff award in 2010. She is looking forward to spending more time with her family, traveling and pursuing her hobby of photography. There will be a reception to celebrate Ernest from 3 to 5 p.m. Tuesday, June 12, from 3-5 p.m. in the courtyard of the Engineering Building (No. 13). 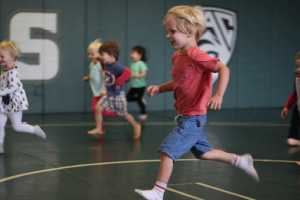 The annual summer Poly Trekkers program at the ASI Children’s Center still has available spots. The program is open to children who have completed kindergarten through fourth grade (6 to 10 years old). Join us for crafts, field trips, sports activities, and a good deal of fun — all while taking advantage of the experiences offered on campus. Registration is available for sessions 1, 2, 3, 6, 7, and 8. Registration ends June 15. For more information, contact Children's Center Administrative Assistant Lauren Mosley at ext. 6-1267 or mosley@calpoly.edu. The Ethnic Studies Department invites you to experience "Bey Day," the culmination of ES 470: Beyoncé: Feminism, Race and Politics from 10 a.m. to 3 p.m. Thursday, May 31, in the UU 220. This one-day event is a showcase of academic panels and performance work around the politics of Beyoncé’s musical and visual canon. The event includes student presentations, dance performances, and spoken word poetry. There will also be opportunities to make art and view an altar dedicated to Women of Color who have lost their lives due to police violence. Free and open to the public, this event is sponsored by the Ethnic Studies Department, the Office of University Diversity and Inclusion, the Multicultural Center and the Gender Equity Center. For more information, contact Jenell Navarro at jnavar18@calpoly.edu. 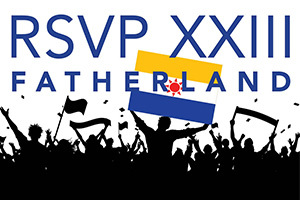 The Music Department’s student production ensemble RSVP will stage the production “RSVP XXIII: Fatherland” at 8 p.m. Thursday, May 31, in the Performing Arts Center Pavilion. Marking the 23rd season of the transmedia series, this year’s production celebrates electroacoustic diversity, compositional risk and belonging. “This show examines what we believe we belong to,” said RSVP Artistic Director Antonio G. Barata, a Music Department faculty member. “Given that we live in such a factional time, this production is profoundly timely. It artistically examines the experiences, contexts, commonalities, spiritual moorings and frailties of human connection. It prompts the audience to consider and reconsider how our sense of self is informed by the groups and organizations to which we belong. At the same time, it challenges who we think is in charge and who really is.” The composition, performance, soundscape and staging combine the creativity of students in Barata’s Sound Design classes with choreography by students Evan Ricaurté, Justin Tomas and Lindsay Eklund, dancers in past productions. Tickets for the performances are sold at the Cal Poly Ticket Office, ext. 6-4849. For more information, visit the Music Department calendar website or call ext. 6-2406. Kyly Whitfield, assistant professor of nutrition at Mount Saint Vincent University in Canada, will present the final STRIDE seminar of the year, “Maternal and Child Nutrition from an International Perspective: a Case of Vitamin B1 Deficiency in Southeast Asia” from 11:10 a.m. to noon Thursday, May 31, in the Baker Center for Science and Mathematics (No. 180), Room 101. Whitfield’s research focuses on public health interventions to combat nutrition deficiencies in resource-poor settings. For more information, email stride@calpoly.edu. Fredric Steck, a retired partner at Goldman Sachs, will discuss how students can augment their degrees, career possibilities and lives with a second (or third) language at 10 a.m. Friday, June 1, in UU 220. Steck will go over the essential skills learned while acquiring another language, explore ways in which those skills and the additional language expand career choices and enhance happiness. During his 25 years with the investment bank, Steck held a number of leadership positions. He earned a bachelor's degree in history from UC Santa Barbara. He’s a private investor with interests in entrepreneurship, education and the environment. 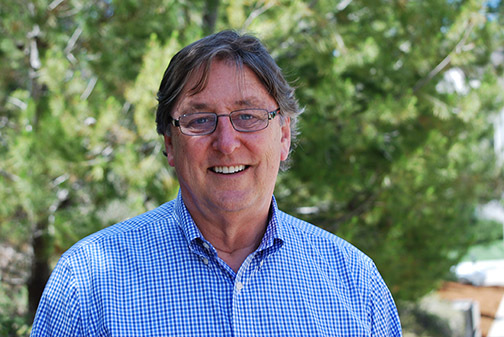 Steck is a board member of Aravo Solutions Inc., an enterprise software company addressing the issue of third party risk and compliance, and chairman of DNP, a holding company with a major investment in Thorne Research, a science-based health and wellness company. A Q&A session and reception with refreshments will follow. More information is available at https://cla.calpoly.edu/events/fredric-steck. The Wind Bands’ Spring Concert will be held at 8 p.m. Saturday, June 2, in the Performing Arts Center. The Wind Orchestra will begin the concert with “Night on Fire” by John Mackey, “To the Sky” by James Stephenson, and “Be Glad Then, America” by William Schuman. Next, the Wind Ensemble will accompany the student saxophone quartet Six Four on Jerome Naulais’ “Saxtory.” The quartet is comprised of software engineering major Victor Wei on soprano saxophone, history major Paige Rooney on alto saxophone, mechanical engineering major Isaac Becker on tenor saxophone and civil engineering and music double major Noah Scanlan on baritone saxophone. “Their individual lyricism and technical facility really needed to be front and center in concert,” Interim Director of Bands Christopher J. Woodruff said. The Wind Ensemble will also perform a new transcription of Antonín Dvořák’s “Golden Spinning Wheel,” by Music Professor Emeritus William Johnson, as well as Paul Hindemith’s masterwork “Symphonic Metamorphosis on Themes by Carl Maria von Weber.” Woodruff will conduct the concert. He was recently named Cal Poly’s director of bands, and he’ll assume the role in September. Tickets for the concert are sold at the Cal Poly Ticket Office, ext. 6-4849. For more information, visit the Music Department calendar website or call ext. 6-2406. The Cal Poly Symphony and Cal Poly Choirs will perform Maurice Duruflé’s “Requiem” and other masterworks by French composers at 3 p.m. Sunday, June 3, in the Performing Arts Center. “The concert will open with a study in orchestral contrast — Camille Saint-Saëns’ energetic and menacing ‘Dance Macabre,’ and Maurice Ravel’s elegant ‘Pavane pour une infante défunte,’” Cal Poly Symphony Conductor David Arrivée said. The Cal Poly Chamber Choir will follow with several unaccompanied French chansons, most notably the famous “Trois Chanson” by Ravel. The first half of the concert will conclude with Ravel’s “Don Quichotte à Dulcinée,” featuring guest baritone Ryan Bede, who will perform with the orchestra. After intermission, the combined choirs and symphony will perform one of the greatest masterworks of the 20th century: Maurice Duruflé’s “Requiem,” Op. 9. “Duruflé’s Requiem is an ingenious combination of ancient chant and modern compositional techniques, resulting in one of the most beautiful works of all time,” said Scott Glysson, Cal Poly’s director of choral activities. 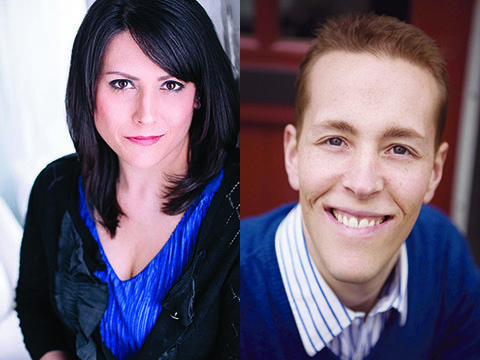 Bede will join in the performance with guest mezzo-soprano Dawn Padula. Padula and Bede are on the faculty of the University of Puget Sound. Tickets for the concert are sold at the Cal Poly Ticket Office, ext. 6-4849. For more information, visit the Music Department calendar website or call ext. 6-2406. 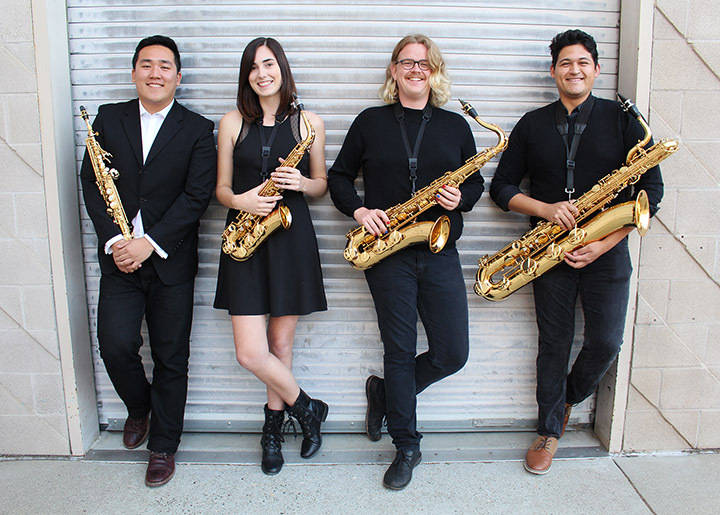 University Jazz Bands will perform a mix of Latin jazz, jazz/rock and traditional jazz — and will throw in a few surprises — at the annual Jazz Night Concert at 8 p.m. Saturday, June 9, in Spanos Theatre. Featured at the concert will be works by jazz composers Don Menza, Michael Brecker and Gordon Goodwin, plus a piece originally recorded by the rock group Steely Dan. Those works include "Sambandrea Swing," which was composed by tenor saxophonist Menza and originally recorded by the great Buddy Rich Big Band, according to Director of Jazz Studies Paul Rinzler. Brecker’s piece, "Peep," is a great example of contemporary jazz, Rinzler added. Composer Goodwin is known for his creative and sometimes humorous arrangements, like his "Hit the Ground Running," which will be performed. Steely Dan’s "FM" is arranged for big band by Fred Strum, who gained international praise as a composer. 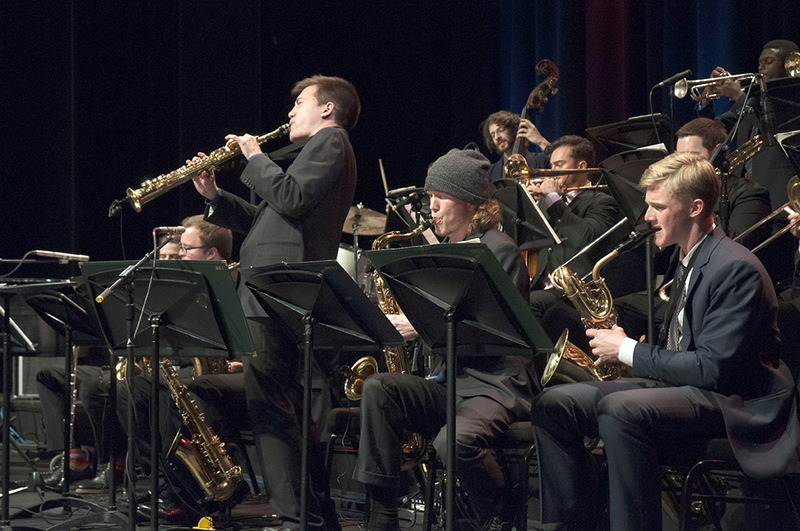 The concert will feature the University Jazz Bands I and II, along with two jazz combos. Tickets for the concert are sold at the Cal Poly Ticket Office, ext. 6-4849. For more information, visit the Music Department calendar website or call ext. 6-2406. 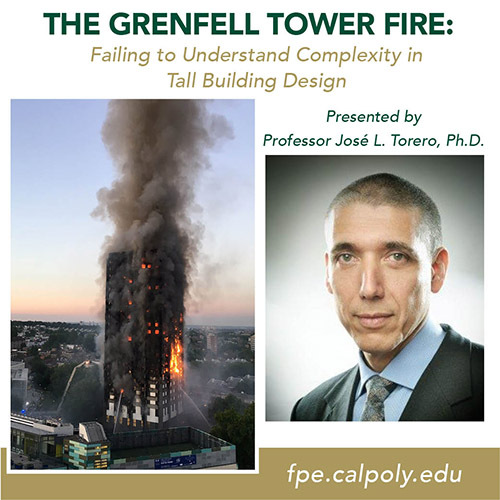 University of Maryland Professor José L. Torero will speak about the London Grenfell Tower fire tragedy from 1:10 to 2 p.m. Thursday, June 14, in the Advanced Technology Laboratories (No. 7). This fire was an extreme example of a technological failure with important policy dimensions. Torero's presentation will discuss, in the context of the Grenfell Tower fire, the design of the building envelope and its role on guaranteeing the safety of building occupants as well as the knowledge gaps generated through complexity and that reduce the designers’ capacity to predict performance. One year later, the performance assessment remains undisclosed, but several buildings housing a low-income population have been evacuated. The expectation is that within the next few months the number of evacuated buildings might reach the hundreds. The associated social impact is going to be enormous. The real question is not only how this failure occurred, but also how a solid regulatory system can deliver a situation where 100 percent of the buildings tested failed the regulatory requirements. Torero is serving in the Grenfell Tower inquiry to provide “oversight of all the technical experts including identification of relevant work streams and addressing any gaps between experts.” He works in the field of fire safety engineering, specializing in the behavior of fire in complex environments such as forests, tall buildings, novel architectures, tunnels, aircraft and spacecraft. The schedule of home events has come to a close for the 2017-18 academic year. #104828 — Admissions Advisor (Administrative Support Coordinator II), Admissions, Recruitment and Financial Aid. $3,115 to $5,316 per month. (Anticipated hiring range: $3,115 to $3,800 per month). Open until filled. #104894 — Director of Financial Operations (Administrator II), College of Agriculture, Food and Environmental Sciences — Dean's Office. Salary commensurate with experience. Open until filled. #104920 — Facilities Warehouse Coordinator (Administrative Support Coordinator II), AFD — Facilities Warehouse. $3,115 to $5,316 per month. (Anticipated hiring range: $3,115 to $3,796 per month). Open until filled. #104921 — Property Analyst (Administrative Analyst/Specialist — Non-Exempt), Administration and Finance — Fiscal Services. $3,288 to $5,983 per month. (Anticipated hiring range: $3,600 to $4,766 per month). Open until filled. #104880 — Financial Aid Scholarship Counselor (Student Services Professional II), Academic Affairs — Admissions, Recruitment and Financial Aid. $4,057 to $5,769 per month. (Anticipated hiring range: $4,057 to $4,200 per month). Open until filled. #104885 — Radiologist Technologist/Medical Assistant (Radiologic Technologist), Student Affairs — Health Services. $2,958 to $5,379 per month. (Anticipated hiring range: $2,958 to $3,800 per month). Open until filled.